Follow this link for a list of the Fall Movie premiers coming in September through December. Just a few jump out at me, but I’m sure the descriptions aren’t nearly as thrilling as the trailers will be. Some of the movies I didn’t mention deserve five question marks instead of stars, such as THE ILLUSIONIST: A stage magician forges on with his old-fashioned act as rock 'n' roll sweeps Britain in this animated tale. Um. . .can’t wrap my mind around the two different things, magic and rock ‘n’ roll. But some on the list may jump out to you like these did to me. Check out the Yahoo link for yourself. At the end of my post titled “You Tube Movie Trailers – Sort Of,” I said there was a lesson for writers in the goofy little films that pair two unlikely genres. Here it is. It’s so simple you’ll wonder why you’ve been on anxious little pins waiting for this equivalent to the Meaning of Life. There. Wasn’t that worth waiting for? In all seriousness, (yes, I can be serious when I try,) I know that this is usually a newbie’s first mistake. They don’t know what they write, so they just sit down and allow stuff to flow from their fingers. I’m not saying this is a bad thing as a newbie. You must experiment to find your voice, your genre. But when it comes time to send that puppy in, you had better not have mixed him with a tiger. Often when I ask new writers what they write, they don’t have a clue. Or worse, they have several faves and don’t know where to start. I’ve heard people state that their project started out as (for example) a historical but turned into a sci-fi thriller. This is simply a toddler taking her first steps. I reiterate. It’s okay when you’re starting out to play with genres. Pick your favorite, and then target your publisher. In many of the guidelines, they will tell you what they want and definitely do not want. Study your market. I’ve listened to countless editor and agent panels and invariably someone will answer the question, “What do you hate,” with, “authors who send me a story in a genre I don’t sell.” And yes, hate is the word used in this context. Lesson: Don’t tick off your potential publisher. So, the moral of the story is, find out your niche, watch the silly You Tubes, and enjoy your writing life. Here are three more entertaining. . .and yet disturbing videos for your amusement. What if. . . The Movie! Coming to theaters this month! 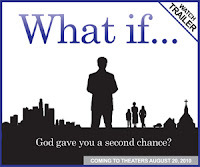 This looks like a great movie with a redemptive message. If we want more good, clean, Christ-filled movies, we must show up at the theaters in force. I hope you all join me! For a list of theaters, go to this site. Note that in some cities, it doesn’t debut until September. Go to the website and view the trailer. Labels: Coming Attractions, WHAT IF. . .